If people or lift trucks pass beneath a conveyor line, what are the considerations? OSHA’s conveyor guidelines focus on guardrails and emergency stops, but when it comes to conveyor safety, the story hardly ends there. One neglected aspect is in areas where people may pass under suspended or overhead conveyors. Here are some best practices for those situations. When items are conveyed overhead, there is always a chance that something could fall off the conveyor. It might be the load, but could also be loose parts from the conveyor itself. Whether that conveyor is 30 feet overhead or 10, if people are passing beneath it, it’s safer to guard the underside of the system. 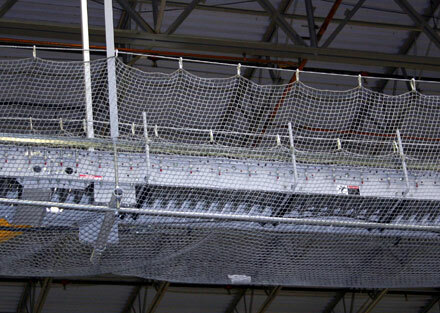 To do that, install conveyor safety nets that catch dropped parts and loads. These nets aren’t terribly expensive, but can help avoid injuries. Aside from that, they can catch falling products and prevent damage to them. They are also easy to remove for maintenance and repairs. Alternatively, guard rails and troughs can reduce the chances of falling loads. These precautions are used on most every overhead system, unless you can set the rollers low and provide a deep enough safe space. When people must cross beneath a conveyor, there are issues of safety and clearance that should be taken into consideration. First, consider what and who will be crossing beneath the line. When people walk under a perpendicular crossing, you need at least seven feet for clearance, but may want more if possible. 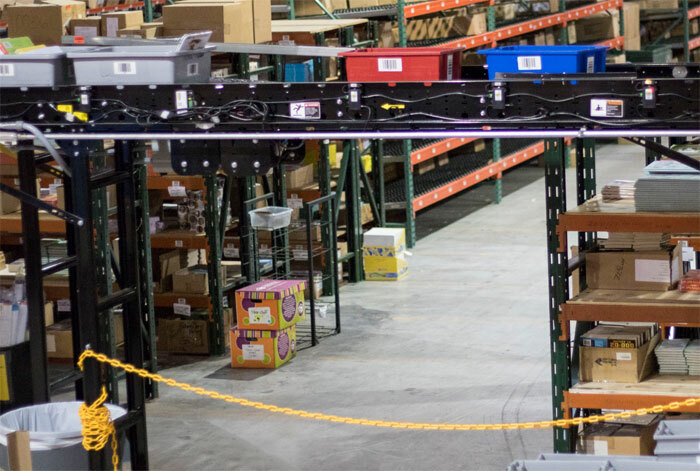 Conveyors mounted less than 10′ off the ground should be fitted with underside bed covers that prevent reaching into moving parts from the ground. Clearance should be set from the bottom of the lowest-hanging component–usually a drive or motor–not the top of belt, frame or rollers. To allow forklifts to clear, you’ll need at least 9 feet of clearance (again from the lowest-hanging component). This assumes that forklifts are passing with lowered masts, and may vary based on the forklift type and model. Consult the specifications for your forklift to be sure. 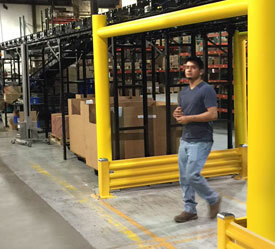 In some cases, where forklifts are passing beneath or near conveyors, you should guard the line with guard rails (parallel to the line) or “goal posts” (at crossings). These safeguards help prevent impacts that could shut your operation down while repairs are being made. If you have a long line of conveyor with pass-throughs, and want to control where people or vehicles cross, then rails, chains, or other measures may be needed to ensure people are passing through at the right spot and situation, where your safety precautions are built. If you can control where people are crossing beneath the conveyor, you can add precautions in the right area and keep everyone safer. These are general guidelines. Specific types of conveyors or situations may require different options. For more conveyor safety information, see our comprehensive guide to conveyor safety. You can always contact us for specific questions.